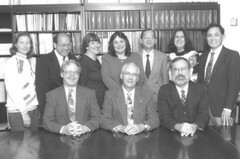 Image of David Longfellow (front, center) and the Longfellow Group. Longfellow was at the National Cancer Institute from 1970 to 2004. He became the Chief of the Chemical and Physical Carcinogenesis Branch, Division of Cancer Etiology in 1981 which subsequently became the Division of Cancer Biology.The Chemical Carcinogen Reference Standard Repository, The Survey of Compounds Tested for Carcinogenicity (PHS 149), and CCRIS were products from his branch.